Log2 fold difference over median abundance (LFQ intensity) in other brain regions is indicated for each brain region. 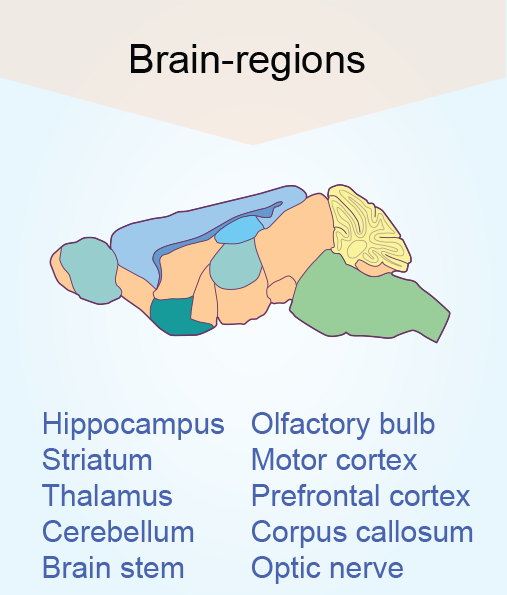 Brain region specific proteins (>4 fold different) in at least one cell type are indicated by “+”. Only proteins that were fully quantified in at least one cell type were included. Differentially expressed 2,901 proteins in mouse brain regions. Log2 fold difference over median abundance (LFQ intensity) in other brain regions is indicated for each brain region only when it is >4 fold different at a p-value <0.05. Differentially expressed proteins are indicated by “+”. The abundance and the enrichment information of proteins are provided for individual brain regions to highlight the most abundant, yet brain-region enriched proteins.